Use the best Forza Horizon 4 cars to ace events or keep your grip in the dead of winter. The upshot is that each event can easily become an exercise in decision paralysis. To try and pick the absolute, undisputed best vehicle for a given race is to stare into the eye of madness. Also AI drivers adjust their own vehicles according to what you pick, so it’s not like you can trounce a grid of superminis in your Koenigsegg. Throw in seasonal events and the varying track conditions they present, and you might as well just turn up to the grid in your heelies. However, there’s plenty to be said for highlighting the cars that are absolutely worth driving in this game, whether the reason relates to raw performance, novelty appeal, or simply because they look and feel wonderful. 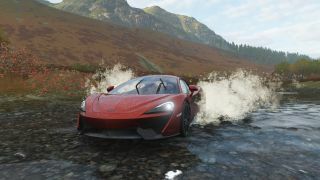 Let us walk you through the forecourt like a grinning used car dealer and show you some of Forza Horizon 4’s best cars. Released to Car Pass owners shortly after Forza Horizon 4’s release, the Agera S is empirically the best car you’re given for free. With a performance rating of 996 out of the box, it’s pretty much the best car full stop—although other hypercars in the S2 category do feel much easier to corner and accelerate in. Probably on account of the fact they’re not in quite so much danger of breaking the sound barrier. The Agera RS’s speed rating of 10 make it the perfect pick to tick off all those speed traps around the map, and to get from A to B sharpish if you don’t fancy fast travel. At some point between the beginning of the RX-7’s production and present day, petrolheads held a secret conference and decided unanimously that it was the coolest car ever in the history of motoring. As such, it’s now a staple of the street racing, modding and drift disciplines, and this 2002 model (added in October for Car Pass owners) will see you right for any of them. Its front-engine, rear wheel drive design makes it a particularly squirly beast, which is perfect for stepping the back end out and earning some drift points, and frankly for having some fun with for its own sake too. Plus, that street racing pedigree makes the RX-7 the perfect canvas for your more avant garde vinyl designs and paint jobs. One for motoring historians and lovers of really fast, unruly offroad cars to enjoy alike. The Rally version of Porsche’s 959 production model won the Paris-Dakar Rally in 1986, and featured a Rothmans livery that’s recreated in colour scheme here at least. If that pedigree leaves you cold, just take it for a spin one crisp autumn morning in Yorkshire and discover how much fun it is to let it scrabble around for grip in each corner while that 2.8-litre twin-turbocharged F6 engine delivers 394BHP. It’s not the kind of workhorse car you’ll tick off a ton of events with, but it’s certainly worth taking out for a spin once or twice. It’s another Car Pass vehicle, added October 2018. There’s nothing like the feeling of balance and stability a racing-spec model of a production car gives you. It might not beat a Lambo in a drag race, but the Civic Coupe GRC isn’t going to step out on you around Edinburgh’s tight 90-degree turns or lose traction through the sweeping curves of those Cumbrian b-roads, either. Added to Car Pass owners’ garages in October 2018, 888, it’s a great S1 class that tunes nicely thanks to that existing stability, and can be used to tick off lots of the early solo races while you save up for something a bit jazzier. Sometimes Forza is about setting hypercars against each other in beautiful settings, settling playground Top Trumps arguments about acceleration and top speed… and sometimes it’s about watching eight three-wheelers just barely big enough to house a human driver knocking against each other in the Yorkshire Dales. The fantastically silly Peel Trident, added to Car Pass in December 2018, packs 4BHP in its 0.048L engine, and is the very embodiment of British engineering and eccentricity meeting in the middle. We’re not saying complete solo career mode in it—we’re just saying it’s an experience to step into one of these things, cockpit cam selected, and race against what look like the top halves of Fallout robots along a B-road somewhere. It’s a Ferrari, isn’t it? Do you need any more reason to slide into the driver’s seat than that? Actually, given that there are dozens of Ferraris in Forza Horizon 4, perhaps you do. The FXX is a track day thoroughbred, taking the basic chassis design of the road-legal Enzo and adding racier touches like an adjustable rear wing. It’s featured in Forza games since Motorsport 2, and while its performance rating is, ahem, ‘only’ S2 961, it’s among the most stable and race-friendly Fezzas you can find. The later LaFerrari models are quicker and perhaps more nimble, but you’ve got to pay for those. If you’re a Car Pass owner, as of November 2018 this one’s yours gratis. If you can forgive that teeth-grinding name and the fact it looks like an energy drink marketing executive’s fever dream, there’s plenty to enjoy about the—excuse us—‘Hoonitruck.’ Firstly and most obviously, it’s a truck. A truck designed to go be incredibly manoeuvrable at high speeds, with a 3.5-litre twin-turbocharged V6 engine. It’s an absolute blast to control, and great in the muddier, slippier seasons when you get tired of schlepping about in a Ford Falcon. With a performance rating of S2 916, it’s fast enough to test your skills in offroad events, and a lot easier to keep tamed than other offroaders with similar BHP. It’s been in the game since November 2018, when it was added to Car Pass owners’ collections. Yep, again. FH3 players will have already spent a lot of time in the One:1 thanks to its peerless straight line speed and surprisingly nimble handling, and despite the inclusion of a few new supercars in FH4, this remains the quickest overall car. Why does that matter? Well, while it’s true that you can compete in any vehicle you choose in the vast majority of FH4’s events, when you do it in a One:1, you complete them quicker. That means blitzing through the game faster and earning credits at a faster rate. Chances are you’ll earn a lot of ultimate high speed bonuses each race too, which will help tick up your influence and unlock car perks—and if you invest those perks back into this car, the more you earn again. The only downside to the One:1, other than its silly name, is that it doesn’t currently have a Forza Edition, so it doesn’t have a speed, credits, or clean/dirty racing boost baked into it. And that leads us rather neatly onto our next pick. What the Zona lacks in outright pace against the One:1, it makes up for with the following: it’s free for all VIP pass owners, handles like a dream, comes in a solid gold finish, and offers a clean skills boost. Like the Koenigsegg, it’s great for finishing solo events quickly and when you move onto PvP, its starting performance rating of 986 means there’s not much more needed in order to max it out to 999. Other racers might have a slight straight line speed advantage at 999, but this is one of the easier hypercars to keep control of throughout a race—it even handles reasonably well in the snow, although we wouldn’t recommend buying one specifically for that purpose. That’s where our next pick comes in. Without a doubt the best car for winter. Fitted with snow tires and balanced perfectly for loose surface handling, the catchily named Gymkhana 9 Ford Focus RS RX garnered fame under Ken Block’s control in various Gymkhana stunt videos on YouTube. If you’re not into that ‘Three different Prodigy album covers having a fight’ paintjob, you can always apply a custom spray—black’s my pick. Even outside of winter, you won’t find a higher performance car for dirt racing and rally events, which makes that 500,000 Credits price tag look positively bargainous. In PVP racing you want a car that retains its balance and easy steering when you max out its performance rating, and that’s exactly what this garish vehicle offers. The only significant downside is a surprisingly low top speed, but during most offroad race types you won’t be hitting the limiter much anyway, so it’s only an issue while freeroaming. I'm still on the fence about this, but pending the release of any further Forza Edition cars, this might be the best PvP multiplayer car. When you’re grinding through solo events we still recommend the One:1 because you’ll have a better chance of acing the speed traps, and because your drives between events will be that tiny bit faster. But when you’re bumper-to-bumper with human opponents, the Veneno’s tradeoff of top speed for handling and acceleration might just come out trumps. Approaching the problem of vehicles from a different perspective, the TTS Coupe you’re offered gratis at the game’s very beginning is a fantastic and surprisingly versatile proposition. It can be upgraded all the way up to an S2 944 for much less than the cost of a real hypercar, is one of the best vehicles in the A category, provides easy and stable handling over road races, and since you can compete in any car during each event there’s no pressing imperative on you to sell up for hours. Weeks, even.